Discolored or stained teeth are common cosmetic dental problems that can make you feel self-conscious about your smile, even if you are in otherwise good dental health. Retailers have shelves full of bleaching trays and whitening strips that promise to brighten your smile, but professional teeth whitening conducted by an experienced dentist offers a number of benefits for those seeking to uniformly whiten their smiles with a single treatment. Hayward dentist Dr. Gary G. Fong is proud to offer the personalized teeth brightening treatment you deserve backed by the highly effective Kör teeth whitening system. To schedule your appointment or learn more about dental teeth whitening, please call 510-582-8727. 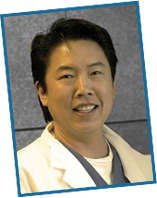 Dr. Fong welcomes patients from Hayward and the surrounding Castro Valley, San Leandro and Union City areas. Teeth whiteners available through dentists, such as Kör teeth whitening, contain stronger bleaching agents than over-the-counter products. This produces more immediate and more noticeable results; retail teeth bleaching kits can require long-term, repeat use to achieve visible results. This also allows professional teeth whiteners to remove stains that over-the-counter teeth whiteners cannot. Over-the-counter teeth whiteners are designed with a one-size-fits-most mentality. These products often feature ill-fitting bleaching trays that can allow the whitening agent to seep onto your sensitive gums and lead to spotty results. Dr. Fong uses custom-fit trays to ensure your gums are not exposed and to provide even dispersal of the whitening compound for a uniformly bright smile. He will also evaluate your teeth color, enamel wear and any existing dental restorations in order to apply the appropriate level of whitener so you can achieve vibrant, natural-looking results. To learn if professional teeth whitening is right for you, please contact Dr. Gary G. Fong today. Dr. Fong is proud to brighten the smiles of patients from the greater Hayward, Castro Valley, San Leandro and Union City, California, areas.